This book explores the interconnected creative partnerships of Mary and George Watts and Evelyn and William De Morgan: Victorian artists, writers and suffragists. It demonstrates how these figures worked, individually and together, to support greater gender equality and female emancipation. The Wattses’ Surrey studio-home became a meeting place for leading artists, writers and feminists of the day. Raised in the Scottish Highlands, Mary Watts (née Fraser Tytler, 1849–1938) was a symbolist artist-craftswoman and designer for Liberty’s whose political activism increased dramatically in later life. The soul replies, I can. Mary’s affirmative answer (in verse) to the earnest question of whether women were strong enough to be law-makers marks her role as a confident and respected suffragist leader and visionary. Her authoritative educational and presidential positions, as well as her attendance at rousing lectures by influential women in Surrey in 1891 (see Chapter 4), made her fit for this role. While Mary advocates the utilisation of ‘feminine qualities’ in the campaign and insists the state needs women’s virtuous influence (in accordance with the NUWSS), her concluding allusion to the famous final lines from Ralph Waldo Emerson’s military-themed poem ‘Voluntaries’ (1863) – which pays tribute to male volunteers prepared to sacrifice their lives in another fight for freedom – seems more suited to a speech addressed to militant suffragettes than to moderate suffragists. This call to arms couched in poetry suggests her more radical suffragist stance and sympathy with aspects of – perhaps even inclination towards – militancy in later life. Lucy Ella Rose is Lecturer in Victorian Literature at the University of Surrey. Her collaborative doctoral award from the University of Surrey and Watts Gallery supported her research on neglected women in nineteenth-century creative partnerships. 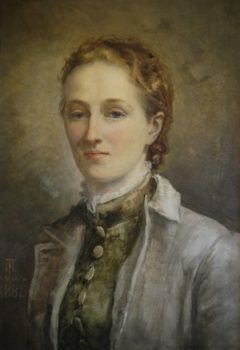 A leading Mary Watts scholar, Rose has worked extensively on the Mary Watts archive at Watts Gallery and assisted the transcription of her diaries. She presents and publishes on Victorian literature, art, culture and feminism. Suffragist Artists in Partnership: Gender, Word and Image by Lucy Ella Rose is out now priced £75 published by Edinburgh University Press. Chocolate. Smuggling. Secrets and Lies. Brazil and London in 1824.